Peter Sloterdijk: Exkurs 7 Über den Unterschied zwischen einem Idioten und einem Engel. In: ders. : Sphären I Blasen. Frankfurt a.M.: Suhrkamp, 479-485. "Die klassische Christologie zeigt die Gesandten- und Botschaftsmetaphysik auf dem Höhepunkt ihrer Macht. Sie gehört einer Welt- und Theoriesituation an, die durch das Dogma des starken Absenders charakterisiert ist. Ja vielleicht ist die diskursive Struktur, die wir Metaphysik zu nennen gewohnt waren, nur ein Reflex der Unterwerfung des Denkens unter die Vorstellung von einem Sein, das als absoluter Absender alle Throne, Mächte und Gewalten mitsamt ihren Ausflüssen an Zeichen und Vermittlern monopolisiert. In diesem unbedingten Absender-Sein konnten der Gott der Bibel und der Gott der Philosophen konvergieren. 207 Den Ausdruck "angeletisch" verdanken wir Rafael Capurro; zur Begriffsgeschichte von angelía vgl. dessen Buch, Leben im Informationszeitalter, Berlin 1995, siebtes Kapitel "Genealogie der Information", S. 97-114. 208 Allenfalls Herman Melville könnte den Anspruch erheben, in seiner Erzählung Bartleby, publiziert 1856, die Wende von der Angeletik zur Idiotik antizipiert zu haben, die Dostojewskijs Roman von 1868/69 dann spektakulär vollzieht. Folgende Beiträge erschienen in The International Information & Library Review, Volume 32, Numbers 3-4, Sept/Dec. 2000 als Antwort auf mein keynote beim EEI21 (The Ethics of Electronic Information in the 21st Century Symposium, Memphis, USA, 2000): "Ethical Challenges of the Information Society in the 21st Century"
"Media conglomerates and the church in earlier times were at the top of a hierarchy that distributed messages to the masses. In the networked society, such a hierarchy which is challenged and may be radically displaced by dialogical media, each person can be creator, producer, distributor and receiver of messages. Rather than a pyramidal structure for the distribution of media, a horizontal one has emerged, thanks to the Internet. And for this reason, Professor Capurro advocates a new science of angeletics, not derived from some supposed incorporeal beings, but whose roots are related to the messages (angelía in Greek) that were conveyed between gods and men (by the poets or god of messages, Hermes, from which hermeneutics is derived). "As the science of messages and messengers, Angeletics has much appeal. As a term, Angeletics may sound like an invitation to study angels and the divine real, a theological endeavor. That is not Capurro's intention. Rather, he seeks to focus attention not on the divine butr on the human and the approaches that the human sciences, the social sciences, might bring to phenomena of message making and message sharing. 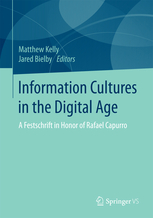 Capurro's interest is to find unifying ways to understand information and its role in human life and global society. Exploring the cultural roots in relation to current issues, Capurro asks if there is help to be found in the study of the message. What is the relationship between the message and the messenger? Is the meaning in the medium of the message? Are content and form separate? Can form and content be separated in order to understand how knowledge is created, transmitted, and used? What is the relationship between hermeneutics and Angeletics? Could hermeneutics be said to dealwith the interpretation of the message or messenger in the aftermath of delivery and prior to another transmission? What are the practices of message creation, dissemination, storage, retrieval, evaluation, and utilization? How do these practices shape the interfacing activity? Who are the messengers in these practices? What are the technologies of messenger practice? Capurro's insights and the question he raises offer a rich agenda for further research. Sociology, Psychology, Political Science, Economics - The Social, Psychological, etc. Aspects of Messages and Messengers. The new understanding gained can be used to build the conceptual foundations of Angeletics. There are similarities to the agenda of social epistemology as described in 1967 by Jesse Shera (Shera, J. (1967): The sociological foundations of librarianship. Sarada Ranganathan lectures, 3. New York. Asia Publishing House) and by Steve Fuller in 1988 (Fuller, S. (1988): Social epistemology, Bloomington. Indiana University Press. ), both of whom see the structures and uses of knowledge and knowledge transmission a keys to understanding social institutions and human life. While shifting away from a preoccupation with the term "information", with all its problematic conceptual ambiguities, Angeletics probes the depths of another etymological river and its tributaries. Angeletics also moves in the direction of studying the processes of message transfer, at the interface as well as before and after. It heightens the role of the transaction, the mediation - the interface, and the mediator - human, print, electronic, cyberspatial/cyberspacial, bricks and mortal. Angeletics does not ignore definition and the value of asking ontological, epistemological, and theological questions. The nature of the message and its goal or purpose are important. What determines the content and the delivery form of the messages? Who receives messages first? Last? To stretch a bit beyond the present discussion into potential uses for Angeletics in knowledge organization and management. Could it be that the agenda for Angeletics might be expanded into specific domain areas, drawing from academic, professional, and popular discourse communities and their practices of knowledge creation. Are the styles, methods, practices and content domains sufficiently different to justify analysis? To plat common elements and patterns as well as disticntive characteristics? Could this be another approach to building controlled vocabularies for information retrieval and domain specific portals to serve particular user communities on the Web? For example, could there be American studies angeletics? Business angeletics? Engineering angeletics? Environmental angeletics? Medical angeletics? Historial angeletics? Biblical angeletics? Medieval angeletics? If the goal of abstract conceptual analysis is to provide a unifying foundation for life in the real world, then angeletics analysis may be the key. We are all creatures of messages and messengers ourselves. How can we unite to understand each other and peacefully separate to preserve identity, unique communities, and accomplish the tasks of life? Willard McCarthy, Centre for Computing in the Humanities, King's College London Humanist Discussion Group, vol. 17, 469: "information"
Siehe auch ders. : Hermeneutic Information Studies of Rafael Capurro. Ethos of the Information Society and the Development of 'Angeletics'. In: SHISO, 2003, No. 951, 89-99. Angelica Walser: Infocalypse now. Gefährlich und erotisch zugleich ist das Internet. Betrachtungen des Philosophen Rafael Capurro über ein antikes Liebespaar im neuen Medium. In: Die Furche (Wien), Nr. 33, 14. August 2003, p. 17. Hans H. Diebner: Operational Hermeneutics and Communication. In: Hans H. Diebner, Lehan Ramsay (Eds. ): Hierarchies of Communication. ZKM / Center for Art and Media, Karlsruhe 2003, 30-57. "In this paper we make some cautious steps towards a cybernetics model for a system of coupled agends, i.e., a communication system, and the gain of knowledge. Each agent per-/re-ceives 'messages'  from the environment / medium (15), whereby the latter as well as the agents' own actions and locomotion, are to be optimized under consideration of the given constraints. In other words, we formulate a model of how brains model the world and compute strategies therewith. (15) Terry Winograd and Fernando Flores  prefer to use the term medium to emphasize the fact that the brain and the environment in which it is embeded are not strictly separable due to Maturana's autopoiesis. Rafael Capurro, Angeletics. This issue. Terry Winograd and Fernando Flores, Understanding Computers and Cognition - A New Foundation for Design. Addison-Wesley, Reading, Mass., 14th edition, 1999. Peter Érdy and Ichiro Tsuda. Hermeneutic approach tothe brain: process versus device? Theoria et Historia Scientiarum, VI: 307- 321, 2002. R. Capurro and B. Hjørland. The concept of information. In B. Cronin, editor, Annual Review of Information Science and Technology, volume 37, pages 343-411. Medford, New Jersey, 2003. Matthias Rath: Das Internet - die Mutter aller Medien. In: Klaas Huizing, Hors R. Rupp (Hg. ): Medientheorie und Medientheologie. Münster: Lit Verlag 2003, 59-69. "Medien haben den Charakter der Ver-Mittler einer Botschaft. Rafael Capurro nennt das Wissensgebiet einer solchen Botschaftstheorie, die auf die Abhängigkeit des Vermittelten vom Vermittler abhebt, Angeletik (4). Dabei sei, und ich stimme ihm zu, die technische Seite besonders zu betonen, d.h. die Frage, inwieweit die zunächst feststellbaren technischen Bedingungen der Vermittlung von Botschaften auf diese Botschaften selbst einwirken, sie bestimmen. Damit seien, so Capurro, "Machtstrukturen" geschaffen, die sich in jeweils unterschiedlichen technischen Medien ausprägen. Daraus folgt, dass Medien das Vermittelte je schon mit gestalten, da sie nur bestimmtes übermitteln: Musik bietet keine trennschafen Inhalte, gesprochene oder geschriebene Sprache keine Bilder, Fernsehen keine Abstraktionen. In diesem Sinne ist dann auch das berühmte und häufig zitierte Wort von Marshall MacLuhan zu verstehen: "The medium is the message". Medien bzw. mediale und damit symbolische Verfaßtheit menschlicher Botschaften sind also eine Charakteristik menschlicher Informationsaufnahme. Medien sind überall. Der Versuch, Medialität als neues, für das Mendienzeitalter typisches anthropologisches Moment zu fassen, geht fehl (5)." 4 Rafael Capurro: Was ist Angeletik? 2001. 5 Matthias Rath: Die Anthropologie des Medialen. Zur anthropologischen Selbstaufrüstung des animal symbolicum. In: Netzethik. Grundlegungsfragen der Internetethik. Hg. von Thomas Hausmanninger und Rafael Capurro. München/Paderborn : Fink 2000, 89-106. Renato Fabiano Matheus: Rafael Capurro e a filosofia da informação : abordagens, conceitos e metodologias de pesquisa para a Ciência da informação (Rafael Capurro and the philosophy of information: approaches, concepts and research methodologies in Information Science). In: Perspectivas em ciência da informação, ISSN 1413-9936, 2005, vol. 10, No. 2, 140-165 (See also here). Ulrike Pailer: Verstehen versus Erklären. Die Geschichte einer unglücklichen Gegenüberstellung. Konzept zur Seminararbeit im Rahmen des Seminars Interkulturelle Philosophie - Hermeneutik im SoSe 2005 bei Univ. Prof. Dr. Franz Martin Wimmer. Chaim Zins: Conceptions of Information Science. In: Journal of the American Society for Information Science and Technology 58 (3), 335-350. Eric Mührel: Das Zwischenmenschliche in der Informations- und Biotechnologie-Gesellschaft. Sybille Krämer: Medium, Bote, Übertragung. Kleine Metaphysik der Medialität. Frankfurt a.M.: Suhrkamp 2008. "Anstelle der vertikalen Botschaft tritt der philosophische logos und der dialektische Mitteilungsprozeß, d.h. das sachliche Fragen auf der Basis jener Botschaften, die uns die Sinne und allem voran die Vernunft (nous) mitteilen und die der Kritik unterworfen werden." Erst auf S. 120 findet man einen knappen Verweis auf diese Quelle mit Hinweis auf die angelia / logos Thematik aber losgelöst vom vorherigen "Zitat". Im übrigen, diese Gedanken findet man bereits in meinem Buch "Leben im Informationszeitalter" (Berlin 1995) S. 99. Ferner: was Frau Krämer auf S. 112-113 schreibt, findet man fast wörtlich in meiner Dissertation: "Information. Ein Beitrag zur etymologischen und ideengeschichtlichen Entwicklung des Informationsbegriffs" (München 1978) S. 46-49, wo man auch den von Frau Krämer zitierten Beitrag von J. Schiewiend "Angelia" im Theologischen Wörterbuch zum Neuen Testament ausführlich zitiert und kommentiert findet. Frau Krämer zitiert auch den Beitrag "Hermeneutik" von Hans-Georg Gadamer im Historischen Wörterbuch der Philosophie und schreibt, dass Gadamer auf die Übersetzungstätigkeit des Hermes explizit verweist. Was aber Frau Krämer entgeht, ist, dass Gadamer auf die Botentätigkeit von Hermes nicht eingeht, wie ich es in meinem Beitrag Hermeneutik im Vorblick. Einführung in die Angeletik(2000) dargelegt habe. "Hinweise" also. So kann man sich als Botentheoretikerin stilisieren, indem man die Konkurrenz pauschal auf eine Fußnote verbannt und durch Auslassen von Quellen Originalität für sich reklamiert. Ferner, indem man Einsichten und Formulierungen (! ), die offensichtlich von einem anderen Autor (in diesem Fall von mir) und von anderen Quellen als die in den wenigen Fußnoten zitierten (lediglich eine Quelle in diesem Fall) stammen, so darstellt, als ob es die eigenen wären. Im Haupttext wird der Name des Autors dieser Ansätze und Formulierungen (auf Seiten 112-113 bzw. 120 u.a.) nicht erwähnt. Nach den zahlreichen Beiträgen – keine bloßen "Hinweise" also – des Verfassers zur Botschaftstheorie und zur Engellehre, die seit 1978 erschienen und auch im Internet zugänglich sind, sucht man im Buch von Frau Krämer vergeblich oder man findet sie an mehreren Stellen als (milde ausgedrückt) Paraphrasen ohne Quellenangabe. "Wir können somit vom personalen Prinzip der Verständigung das postalische Prinzip  der Übertragung deutlich unterscheiden." Denn auch wenn wir jetzt von einer Theorie der Botschaft im anthropologischen Kontext sprechen, ist das, was ich das postalische Paradigma nenne, als methodische Grundlage der Naturwissenschaften heute vorherrschend. Dieses Paradigma verdankt sich unterschiedlichen Einflüssen, nicht zuletzt der Shannonschen Kommunikationstheorie sowie der Entwicklung des Computers. Die Rede von Erbinformation in der Biologie übt in Zusammenhang mit der Entzifferung des menschlichen Genoms eine wohl dramatische und zum Teil auch traumatisierende Wirkung auf das Selbstverständnis des Menschen im beginnenden 21. Jahrhundert aus. [...] Eine Theorie der Botschaft ist selbst eine Botschaft in einem bestimmten Sinne, nämlich in einem philosophischen. Auf den Sinn einer philosophischen Botschaft kommen wir später zu sprechen ohne aber dieses Thema hier ausführlich behandeln zu können. Eine ausdrückliche angeletike techne oder eine ars nuntiandi scheint es dem Wort nach bisher nicht gegeben zu haben, wohl aber der Sache nach, von den verschiedenen Lehren und Techniken - von den Persischen Boten, über Briefe und die neuzeitliche Post bis hin zum Telegrafen und Telefon sowie zu den heutigen Mails - Botschaften zu senden und zu verbreiten, vor allem im politischen, ökonomischen und religiösen Kontext. Sicherlich gehören die rhetorische Tradition, die Tradition der Ausbildung politischer Botschafter sowie die heutigen Marketingtheorien vor allem in Zusammenhang mit den Massenmedien und dem Internet zum Bestandteil einer Angeletik. Man könnte sagen: die paradigmatische Revolution der New Economy besteht nicht zuletzt darin, dass Waren als digitalisierte Botschaften weltweit vermarktet werden können. Ohne (digitalisierte und weltvernetzte) Werbung gibt es keinen (neuen) Markt. Wenn sie in Anschluß an John Durham Peters "Dissemination" als "Nichtreziprozität" (S. 92-93) ist das, auch bei Peters, nicht einsehbar, warum das postalische Paradigma eine solche "Nichtreziprozität" bedeuten muß. Es ist gerade das Besondere des Internet, dass die Verbreitung von Botschaften reziprok stattfindet, dass also der Empfänger zum Sender mutieren kann. Das unterscheidet die sokratische "dialektische" Revolution von der nicht-reziproken mythologischen und dichterischen Dissemination. Postalische Reziprozität muß nicht "erotische Begegnung" bedeuten. Das scheinbare "Gegenbild zum sokratischen Dialog" im "diskursiven Verhalten des Jesus von Nazareth" hat mehr vom mytischen Paradigma der vertikalen nicht-reziproken Sendung als Peters und Krämer wahrhaben wollen. die eigene Originalität nicht auf Kosten der Nichtberücksichtigung oder 'Verkleinerung' der Beiträge von Kollegen ('Fußnoten-Taktik' mit Hinweis auf 'Hinweise'), die 'leider leider' dieses aktuelle Feld längst 'besetzt' haben. Sind einige dieser im Buch von Frau Krämer aus meiner Sicht erkennbaren Übertretungen dieser Kriterien, die an Studierenden vermittelten Exzellenzstandards zur Qualitätssicherung wissenschaftlicher Forschung an einer deutschen Hochschule? Offensichtlich nein, zumindest wenn man den Ehrenkodex. Satzung zur Sicherung guter wissenschaftlicher Praxis der Freien Universität Berlin liest. "SZ: Was ist eigentlich ein Plagiat? Frühwald: Das ist eine wissenschaftliche Arbeit, in der Kernargumentationen und Kernthesen aus Fremdarbeiten übernommen und diese Zitierungen nicht gekennzeichnet werden. Dabei geht es nicht um einzelne Formulierungen." Aus: Wolfgang Frühwald, von 1992 bis 1997 Präsident der Deutschen Forschungs- gemeinschaft, im Gespräch mit Patrick Illinger: "Der Konkurrenzdruck ist mörderisch" . In: Süddeutsche Zeitung, 18. Oktober 2012, Nr.241, S. 22. "Wir betreiben keinen politischen Prozess"
Michael Piper: "Die Wissenschaften haben eines gemeinsam, über die Kulturen der unterschiedlichen Fächer hinweg: Wissenschaftliche Leistung besteht nicht darin, Fakten oder Textpassagen zu sammeln, sondern in neuer Erkenntnis. Diese muss vom Autor stammen und als solche erkennbar sein. Das ist heute genauso wie vor dreißig Jahren." Aus: Michael Piper, Rektor der Universität Düsseldorf, im Gespräch mit Roland Preuss: "Wir betreigen keinen politischen Prozess". In: Süddeutsche Zeitung, 20.-21. Oktober 2012, Nr. 143, S. 6..
"Problematisch ist weiterhin, dass Krämer die zahlreichen Übertragungstheorien (etwa Bernhard Siegerts Studie zur Post oder Rafael Capurros Angeletik) fast ausschließlich in die Fußnoten verbannt und damit zu Ergänzungen ihrer eigenen Theorie macht. Zu oft sind Übertragungs- und Botenmodelle in der bestehenden Literatur thematisiert worden, als dass Krämer Neuland betreten würde, und Nancy, Serres und Peters sind keine Entdeckungen, sondern anerkannte Diskurspartner." Sybille Krämer: Medien Boten, Spuren. Wenig mehr als ein Literaturbericht. In: Stefan Münker und Alexander Roesler (Hrsg. ): Was ist ein Medium? Suhrkamp 2008, 65-90. 13. Rafael Capurro, "Theorie der Botschaft", in: Ders. : Ethik im Netz, Stuttgart 2003, S. 105-122. 14. Michel Serres, Die Legende der Engel, Frankfurt/M. 1995. 15. Régis Debray, Transmitting Culture, New York 2000, S. 31 ff. 16. Helmut Willke, Atopia. Studien zur atopischen Gesellschaft, Frankfurt/M. 2001, S. 70ff. 17. Horst Wenzel (Hg. ), Gespräche - Boten - Briefe. Körpergedächtnis und Schriftgedächtnis im Mittelalter, Berlin 1997, S. 15f. 18. Herodot, Historien, VIII, 98." In diesem "Literaturbericht" findet man eine ausdrückliche Anerkennung meines Beitrags zur Boten- und Botschaftstheorie, die im vorhergehenden Buch verborgen blieb oder, milde ausgedrückt, paraphrasiert wurde. Frau Krämer erwähnt aber seltsamerweise den von mir geprägten Begriff "Angeletik" nicht. Dieser Begriff stellt den Schlüssel dar, um eine säkulare Boten- und Botschaftstheorie von der theologischen Engellehre zu unterscheiden jenseits jeder "Analogie" auf die Frau Krämer meine Beiträge einschränken will. Der Begriff message society stammt, soweit ich weiss, von mir und wird im von Frau Krämer zitierten Beitrag (Siehe oben) ohne Angabe der Herkunft verwendet. Nach Anführungszeichen und Urheber sucht man auch hier vergebens. Beata Sirowy: Understanding the Information Society: The Potentials of Phenomenological Approach. In: Frank Eckardt (Ed. ): Media and Urban Space: understanding, investigating and approaching mediacity, Berlin: Frank & Timme, 2008, 45-64. "Although phenomenology is a philosophical current with a considerable tradition, it still proves its pertinence being in the center of interests of many contemporary thinkers. The influence of phenomenology has not been as wide-spread as post-structural thought, but what is important – phenomenological hermeneutics is currently seen as one of possible conceptual directions after postmodernism (Madison 1997 & Capurro 2003)." (Sirowy 2008, 49). Erich Hamberger, Kurt Luger (Hrsg. ): Transdisziplinäre Kommunikation. Aktuelle Be-Deutungen des Phänomens Kommunikation im fächerübergreifenden Dialog. Wien: Österreichischer Kunst- und Kulturverlag 2008. "Capurro setzt sich mit dem Phänomen Kommunikation also aus dem Blickwinkel der Übermittlung von Botschaften auseinander. Die Aktualität der Themataik ergibt sich - wie erwähnt - schon allein aus dem Umstand, dass wir in einer Kultur/Epoche leben, in der wie nie zuvor in der Menschheitsgeschichte - insbesondere sseit dem rasanten Aufkommen des Massenmediums Internet - Botschaften ausgetauscht werden. Was jedoch offenkundig fehlt, ist eine relevante Theorie der Botschaft. Mohammad Khandan: What is angeletics? Persian translation by Mohammad Khandan. In: Science Communication. The monthly journal of Irandoc. Vol. 45, September-October 2009. "[...] Auch Raphael (sic) Cappuro (sic) hat sich an einer Bestimmung des Medienbegriffs über eine "Theorie der Botschaft" versucht, in deren Zentrum er eine philosophische Lektüre der theologischen Figur des Boten gerückt hat. vgl. R. Capurro, "Theorie der Botschaft", in: ders. Ethik im Netz, Stuttgart: Franz Steiner Verlag 2003, S. 105.122. Mohammad Khandan: Angeletics: a message theory. Persian translation by Mohammad Khandan. Forthcomming in: Mohammad Khandan (Ed.) Epistemological Explorations in the Realm of Information Studies. Tehran: Chapar (2010). John Holgate: The Hermesian Paradigm: a hermeneutic perspective on ICT based on Rafael Capurro's Angeletics and Vilém Flusser's Communicology. In: International Society for Hermeneutics and Science, July 17, 2010. Rafael Capurro - John Holgate (eds. ): Messages and Messengers. Angeletics as an Approach to the Phenomenology of Communication. Von Boten und Botschaften. Die Angeletik als Weg zur Phänomenologie der Kommunikation, ICIE Schrifenreihe 5, München: Fink 2011. Giannis Stamatellos Plotinus' Angeletics: A Neoplatonic Message Theory. Information: Special Issue "Angeletics - Messaging Theory"
Koichiro Matsuno: When an Atom becomes a Message - Practicing Experiments on the Origins of Life. In: Automatic Documentation and Mathematical Linguistics, 2012, Vol. 46, No. 2, pp. 94-104. Original Russian text, Nauchno-Tekhnicheskaia Informatsiya, Seriya 2, 2012, No. 4, 1-12. Markus Stock: Letter, Word, and Good Messengers: Towards an Archaeology of Remote Communication. In: Interdisciplinary Science Reviews, Vol. 37, No. 4, December 2012, 299-313. "Although the messenger becomes as indifferent to the message as today's mail carrier, and is thus entirely heteronomous (Capurro 2003, 109; Krämer 2004, 111-112; Knödler-Pasch 2011, 141), there is the danger of autonomy in other respects: namely tht he does not remain faithful to his office, i.e. does not remain the neutral carrier, either because of unwillingness or owing to intoxicanting influences from outside. This is a leitmotiv of the treatment of messengers in late medieval and early modern culture, both reflected in historically testified cases (see, for example, Hacke 2005, on the problems the University of Paris had with its messengers) and in late medieval moral-didactic literature. I now discuss the reverberations of this negative stereotype of messengers in the widely disseminated 'Liber de moribus', the so-called Chess Book by the Dominican friar Jacog of Cessolis from around 1300 (Plesso et al. 2007, 49-51)." (Stock 2012, 308). Hacke, Martina. 2005. Gesandschafts- und Botenwesen der Universität von Paris (13.-15. Jh. ): Eine Skizze. In Kommunikation im Spätmittelalter: Spielarten, Wahrnehmungen, Deutungen, ed. Romy Günthart and Michael Jucker, 101-109. Zürich: Chronos. Krämer, Sybille. 2008: Medium, Bote, Übertragung. Kleine Metaphysik der Medialität. Frankfurt a.M.: Suhrkamp. Plesso, Oliver, Volker Honemann and Mareike Temmen. 2007. Mittelalterliche Schachzabelbücher zwischen Spielsymbolik und Wertevermittlung. Der Schachtraktat des Jacous de Cessolis im Kontext seiner spätmittelalterlichen Rezeption. Münster: Rhema. Rafael Capurro, Michael Eldred and Daniel Nagel: Digital Whoness: Identity, Privacy and Freedom in the Cyberworld. Heusenstamm: Ontos Verlag (Berlin: de Gruyter) 2013. With some minor qualifications in relation to the capability of science, I can accept essentially Capurro’s entire thesis. As I have discussed elsewhere , for LIR, what makes human beings uniquely human can also be defined by the interactions between individuals in which meaningful messages, in contrast to just the simple information necessary for survival, are exchanged. The concept of messages makes particularly clear the role of man in the universe where there is a physical, as well as a philosophical, ground of those interactions. Capurro’s conception is “not to forget that we are part (or players) of the “angeletic” interplay with and “in” the world. And, this openness to the world means a “restriction” of the infinity of the world. However, if at the same time we understand it as a restriction, we are free to perceive the message of the “whole”. This is another way to gain understanding of contradictory phenomena in addition to the dialectical or informational ones discussed above. The freedom we acquire is similar to the increased degrees of freedom, in Luhn’s conception, resulting from information about the circumstances of our existence that drive us towards “fairness”. Globalisierung (Informationsübermittlung wirtschaftlicher Daten in Sekundenschnelle). Der entscheidende formale Unterschied religiöser Vorstellungen von der Funktion des Boten und seiner Botschaft zu den Konzepten säkularer Angeletik ist, daß das vertikale Modell durch ein horizontales, oder mit Welsch und Sandbothe zusprechen, durch ein transversales ersetzt wird. Allerdings ist diese Ersetzung nicht vollständig gelungen, vielmehr kam es zu einer Durchmischung. Der Landesfürst der Neuzeit beherrschte zwar von einer Metropole aus ein Territorium (horizontal), aber dieses durch eine vertikale Machtstruktur. Zwar ermöglichte der Buchdruck eine flächige, d.h. horizontale Ausbreitung von Wissen, aber die Entwicklung eines Begriffs von "Geistigem Eigentum" reterritorialisierte eine Konzeption einer vertikalen Wissensdiffusion vom Urheber über die Verteiler zum Bildungsbedürftigen und verhinderte die Realisierung der aufklärerische Idee einer République des Lettres, in der jeder jeden kritisierte zum Wohl des Gedeihens von Wahrheit und Erkenntnis. In der Medientheorie der Wirkung der Massenmedien auf eine Masse, überlebt diese ezugleich vertikale und horizontale Denkstruktur. Erst eine Theorie, die die Netzstruktur des Wissens und seiner Verbreitung ernst nähme, hätte die Vertikale ganz hinter sich gelassen. Heute wird versucht (so Rupert Murdock), durch Ökonomisierung erneut eine vertikale Struktur in das Wissen einzuziehen. Nur wr zahlt, soll etwas wissen dürften. Allerdings erlaubt es eine Angeletik auch, zwischen einre Idee der Totaltransparenz (so die aufklärerische Idee) und einer partikularen Vor-Ort-Transparenz einer schwachen Vernunft zu unterscheiden. Sie propagiert nicht den Überblick über das Ganze, was ja immer ein Ausweichen in die Vertikale voraussetzt  sondern einen wie immer auch begrenzten Druchblick (auf derselben Ebene des Labyrinths verbleibend). Die Angeletik realisiert, daß mit dem Internet ein Medium besteht, das sowohl interaktiv ist wie das Telefon als auch eine hierarchisch distributive Wissensverteilung erlaubt wie das Fernsehen, so daß es sowohl die Stuktur one-to-one als auch die Struktur one-to-many und damit genau auch die Struktur many-to-one ermöglicht. Es ist eder die rein dialogische Kommunikationssituation noch die top-down-Struktur, sondern die konkrete Realität eines netzes, in dem Vielerlei möglich ist. K. Röttgers: Transzendentaler Voyeuriemus. In: Theorien des Dritten, hrsg. v. Th. Bedorf, J. Fischer, G. Lindemann, München 2010, p. 33-71. Lyn Robinson: On Information, and Digital Ethics: thoughts from International Society for Information Studies 2017 Summit. Gustavo Saldanha, Rodrigo Bozzetti: Information Philosophy, Document and DNA: The "Document Man" and the Biobanks. In: Digitalisation for a Sustainable Society, Gotheburg, Sweden, 12-16 June 2017. Anna Marmodoro: Power Structuralism in Ancient Ontologies University of Oxford 2017.